There is a new delicious property on ThriftyUmbria.com, its name is Villa Bastiola, and you may already have encountered this charming property in Umbria on the Internet. We are glad to have it on our website and happy to kick off with a nice last minute offer on the property. From May 14 until June 18, 2011 the owner offers a 10% discount over weekly rates for an even more special self catering holiday in this luxurious private villa in Umbria. Discover even more offers at the official site of www.villabastiola.com. Recently remodeled, and surrounded by a perfectly groomed garden, your holidays are going to be a treat at Villa Bastiola. Did you know that the property sits right by the border between Tuscany and Umbria? This means you can have the best of the two regions. The location is near everything and just a short drive from must-see towns like Cortona in Tuscany, Spello, Gubbio, Perugia, Assisi, Todi, Orvieto and many more. What's more, since Perugia's airport started taking in international flights a few years ago, you can get to Villa Bastiola in a jiffy. Take a direct flight from the UK and half hour after landing you will be in the lap of this heaven in the green heart of Italy, as Umbria is often referred to. This is no exaggeration. At the villa you have the tangible feeling of being far from everything. You will have a rare sense of peace in the comfort of this home in Umbria, and remain in awe every morning while having breakfast in front of one of the most inspiring sceneries in the world. Yet, you will be close to many world-celebrated sights. Rest assured that there is not a hint of cliché at Villa Bastiola. 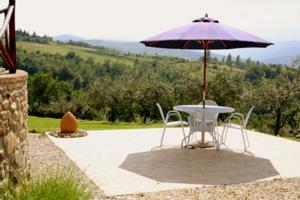 It hardly gets better than this, especially with such unbeatable prices to treat yourself to a luxury holiday in Umbria.